I read an article recently that resonated deeply with me. It talks about one remarkable fact of the hawkers that plied their delicious cooked food in hawker centres like the photo you see on the left. The fact that you can still get food for less than S$2 (about US$1.30) that includes eggs, vegetables and meat. Think about it. With fuel prices rocketing last year, along with GST increases to 7% two years ago, rice prices reaching never seen before levels since the Japanese Occupation and the increase in the general cost of living in Singapore, a lot of hawker centre food stalls have maintain low and affordable prices for most Singaporeans. If I ever migrate out of this country to live and work elsewhere, besides missing family and friends, the hawker centre and the food served there will be the only other thing I will miss. 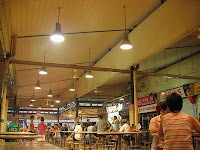 The hawker centre in Singapore has been named one of the 1001 things to do before you die. The Lonely Planet guide to Singapore says that the hawker centre is a great leveller in a city that tends to be a bit snobbish. A bit? I would have thought that it is a lot. So for keeping prices low despite rising costs of living and in the midst of a worldwide crisis, the stall holders that populate the Hawker Centre are my heroes of 2008.